It is a webmail service by Microsoft to access Outlook mail client account when used in conjunction with Exchange Server. 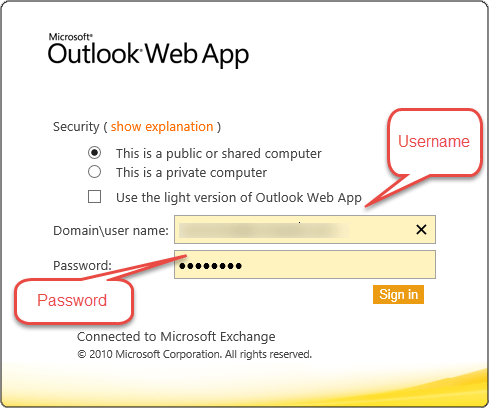 It was originally named as Exchange Web Connect, then Outlook Web Access and finally Outlook Web App. However, it is better known as OWA. It was introduced with Exchange version 5.0. The app is developed to have 'anywhere access' of Outlook data items, with the assistance of just a web browser and Internet connection on a computer system; without having the need to install Outlook and remain stuck to a single desktop PC. It is very useful for organizations as it provides work access to employees everywhere even when away from office on move. In this way the productivity of business or enterprise where Exchange has been setup improves. It's Use And Functionality - OWA supports S/MIME and includes characteristics with the help of which all data items such as emails, calendars, contacts, tasks, documents and other content in the mailbox can be accessed and managed. 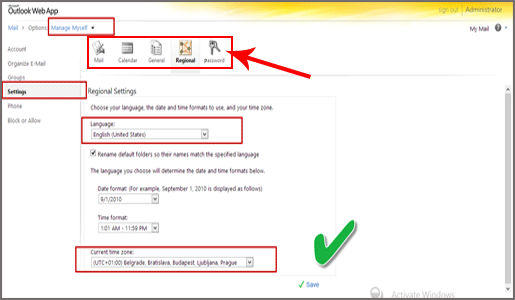 With each new version of server environment facilities in OWA has been improved. This can be proved from the fact that in Exchange 2007 edition, read-only access to documents that are stored within MS Share Point is provided which was not present in versions earlier to 2007. Unlike Outlook, OWA does need Internet connectivity to the Server for users to work with. Moreover it neither restricts the use of browser nor operating system which is present in Outlook. Without doubt it can be concluded that OWA is a valuable app for people who are on move, want remote access and use platform other that Windows such as UNIX and Apple. This is because the app utilizes web browsers and not desktops to open Outlook. The OWA address of each organization differs from one another. Though the address of OWA varies with establishments, its default address is the DNS (domain name server) name of mail server followed by /exchange. For e.g., for mail server https://smtp.ovewriter.com, its OWA address becomes https://smtp.ovewriter.com/exchange. Here, HTTPS is the secured version of the normal HTTP web protocol. Web Browser – Any web browser such as Microsoft Internet Explorer, Mozilla Firefox, Google Firefox, and Safari browser is necessary to browse OWA. Internet Connectivity – Connection to the World Wide Web network is essential to have access to OWA. Operating System – Any operating system such MS Windows, Apple's Mac, UNIX is necessary to utilize OWA to have access to Exchange Server Outlook. At least version 7 of Internet Explorer, Firefox 3.X and Safari on Mac should be used to get access to standard release of OWA. This is because they provide 99 percent accessibility to features. Note – If standard versions of web browsers are not used then the OWA light gets opened up, which does not provide all the features. OWA Light Version – OWA Light is limited to certain features only. It can be used to send/receive mails, manage contacts, manage calendar and to set certain limited options. How to Log-in to use OWA? First a web browser should be opened to browse OWA address. Then the dedicated address for an organization's OWA should be typed-in. Users then need to provide regular network logon name and passphrase. As the interface of OWA depends on organizations; sometimes, on the same screen a selectivity preference is provided to choose between a shared and a personal system, whichever applicable. How to Sign Out From OWA? It automatically closes its connection to the mailbox after a certain time frame of idleness. This is done to shield account from unauthorized access. However, if session ends, the browser can be refreshed to log on again. As the interface is build up almost same as Outlook (though it depends on organizations), an option is provided to log out. 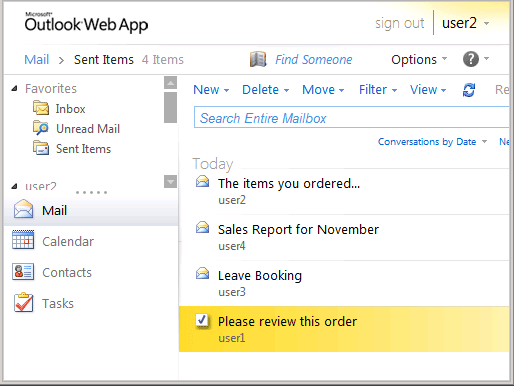 Similarity - Organizations prefer to design OWA similar to Outlook. This is to provide ease to users as OWA is just an online form of Outlook desktop mail program. 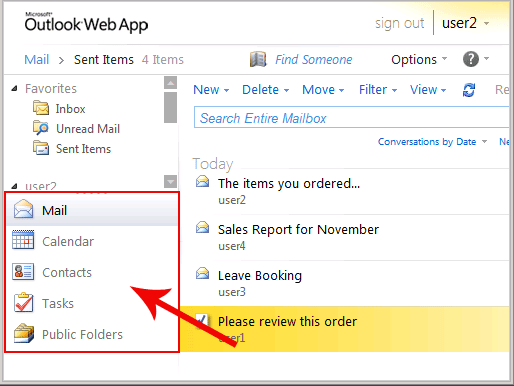 Almost all features of Outlook are rendered such as mails, contacts, calendars, tasks, reminders, etc. Similarity between the two is clear from the figure 1 shown above. Difference - The difference is that in OWA, menu bar is not rendered across the top. However, most of the functionalities that are available in the menu bar of Outlook are located elsewhere in OWA. Note - If any characteristic is not found in rest of the page, 'Options' tab should be clicked which is located at bottom left corner of the OWA Window. When Option button is clicked upon, Options page opens up. Navigation Pane - It contains all mail folders and provides easy and quick access to Contacts, Calendars, Tasks and other items. 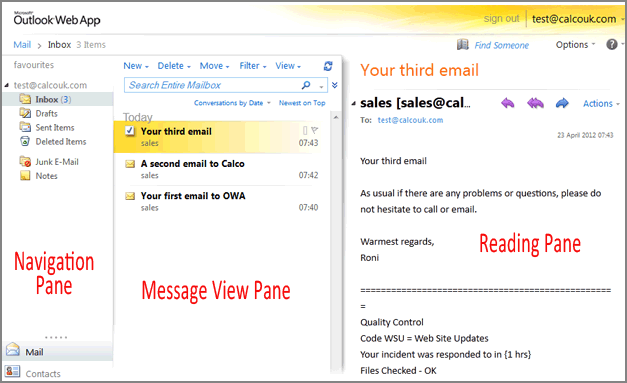 Message View Pane - It functions as the Inbox and contains all received emails. Reading Pane - It displays the content of selected message. Inbox – Contains received emails by senders. Calendar – Form and manage appointments/meetings. Contacts – Contact information can be created, stored and managed. Tasks – To-do things with/ without reminders options. Pubic Folders – Even public folders are provided for several other tasks. Rules – Several rules can be set for sending and receiving of mails. Options – To alter calendar, reminder, contacts, etc. What does 'option page' Include? Note - The selection tab can be clicked upon to access the various tools of OWA. The table below shows a comparison between Outlook Web App web service of Exchange and Outlook desktop mail program. 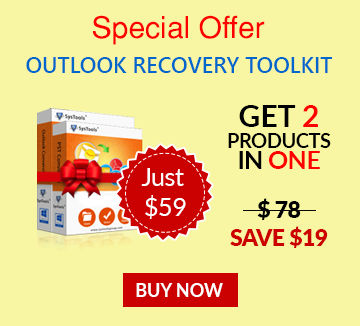 From the page it can be found that Outlook Web App serves a vital purpose in accessing Outlook Exchange client server mailboxes from anywhere. With this added feature in Exchange it has become quite useful for establishments to maintain productivity as well as expand business quickly. This is because employees can remain connected with each other and carry on with work even when on move.